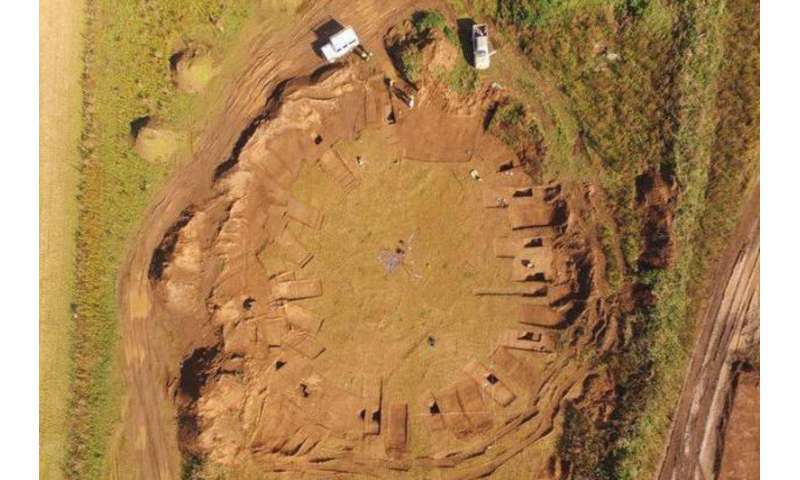 A team of researchers led by freelance archaeologist John Tibbles has found evidence suggesting that a woodhenge discovered in Yorkshire several months ago might have been used for sacrifices, or perhaps as a sauna. Tibbles spoke to the Yorkshire Post recently, offering up details of the site and his ideas on its purpose. The woodhenge was discovered at Little Catwick Quarry in Yorkshire, near a town called Hornsea, and was part of a site that has been under excavation since 1992. Even after surface excavation, however, it is still difficult to make out the configuration of the site—from the air, however, things become clearer. It forms a large circle with rectangles at its edges and a pile of small stones at its middle—the circle is made by a ditch and an outer sand bank. The site has been dated to approximately 4,000 years ago, putting it at the edge between the Neolithic and Bronze Age. Work done at the site, Tibbles reports, showed that the rectangles at the edges were bases for what appeared to be wood pole buildings or simple benches. There were also two entrances, one on the northwest side, the other on the southeast side of the circle. The pit at the center of the site has been the object of much study—it's a hole filled with burnt stones that appear to have been carried to the site after heating. Similar stones were found buried near the entrances. Tibbles suggests that the stones indicate the possibility of rituals, possibly for cremation, in which bodies were burned and then removed. He notes that it seems logical to consider that there might be a link between the site and the site at Sandsfield, which is just a mile away and has a cemetery with a ring ditch and 37 urns, and dates back to around the same time period. Tibbles suggests there is also another possibility—that the site was actually used as a large sauna. Heated rocks could be carried in, he notes, followed by some water to toss on them for steam. The site could be a sweat lodge similar to those used by early American Indians. The researchers plan to continue digging in the spring as the quarry is extended.